​Mothers from across the United States poured into Washington, DC on Saturday, choosing Mother’s Day weekend to march for justice for the loved ones they have lost to violent encounters with law enforcement. Dubbed the “Million Moms March,” the event featured hundreds of people marching to the US Department of Justice and calling for police reform around the country. Mothers and others participating held up photographs of people killed by police. The crowd was carrying an abundance of signs and yellow balloons with peace symbols on them, as well as many flowers bouquets. Mothers for Justice United was created after Milwaukee’s Maria Hamilton lost her 31-year-old son, Dontre, during a confrontation with police. A little more than a year ago, police officer Christopher Manney confronted Dontre, who was reportedly mentally ill, at a local park with a pat-down. When Dontre resisted, he was hit with a baton and shot 14 times. Police eventually determined the pat-down was unnecessary, violated Manney’s training and escalated the situation. Manney was fired but never charged with a crime. In an interview with ABC 12, Hamilton added that she is using this moment – one during which much of the country is focused on tense police-community relationships – to create momentum for change. "My mission is to make people aware that this is a bigger problem than anybody actually thought," she said. "Now that the doors have come open, we want the doors to stay open until things start to get fixed." 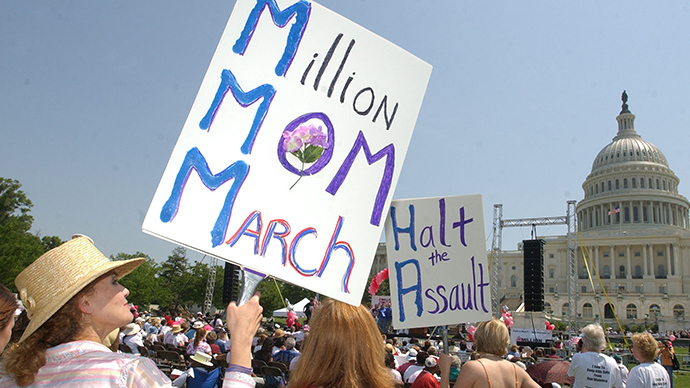 Of course, the march isn’t limited to mothers. On Facebook, people from around the US declared their intention to march in DC. One woman from Utah said she would be there because an officer shot and killed her husband because he didn’t identify himself while he was shoveling snow.